Still looking for somewhere to spook and be spooked this Halloween? Look no further than Fort Lauderdale! The Wilton Manors neighborhood of Fort Lauderdale is well-known for its lively and fun Halloween experience. A Wilton Manors Halloween is guaranteed to provide visitors with the most unforgettable costume sightings, nightlife, and inclusive atmosphere. Need help filling out the rest of your itinerary? Our complimentary Fort Lauderdale Vacation Guide is our hand-picked list of the area’s most amazing points of interest. Download it today so you can start looking forward to a legendary Halloween! Wicked Manors is one of the largest Halloween street festivals in the state of Florida! Hosted by The Pride Center of Fort Lauderdale, this historic block party-style celebration takes place on Halloween night from 6:00 to 11:00 p.m. this year. It brings between 15,000 and 18,000 costumed revelers to the streets of Wilton Manors! Wicked Manors is free to attend, but donating to The Pride Center is encouraged! Guests can help by donating directly or simply purchasing a drink ticket. Not only is Wicked Manors one of Fort Lauderdale’s benchmark events, but it supports a great cause, too! The Pride Center’s mission is to provide a welcoming space that celebrates and empowers the LGBTQ community of Fort Lauderdale. Events like Wicked Manors contribute to the distinct cultural, health, and educational efforts of the Pride Center, so you can feel great about attending! The theme for 2018’s Wicked Manors is “Game Night,” so start putting together your best game-related garb! Expect to see numerous variations of your favorite board games, video games, and more. There will also be plenty of local food vendors and events taking place on multiple stages. These displays include drag shows, live music, and contests. Check the Wicked Manors Facebook page for regular updates! Book Your Wilton Manors Halloween Trip with Fort Lauderdale Stays! You want to see the Wilton Manors Halloween festivities for yourself, but where will you stay? The answer is simple: A private and luxurious home away from home where you feel welcomed and pampered. Fort Lauderdale Stays manages a variety of gorgeous, upscale homes in the Wilton Manors neighborhood, just right around the corner from the center of town. Our Wilton Manors accommodations are spacious, pet-friendly, and packed with deluxe amenities! Take a look at our Wilton Retreat property. This two-bedroom, one-bathroom house is right around the corner from The Pride Center of Fort Lauderdale. 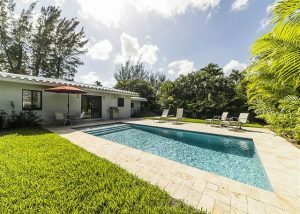 Featuring a full kitchen, spacious living room, and a private, heated pool, this redone property is the perfect South Florida tropical oasis. Halloween will be here before you know it. Book your getaway now while there’s still time!